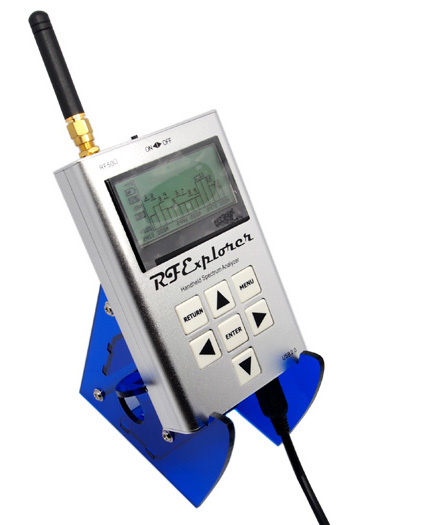 This is a delightful stand holder of high quality for your RF Explorer. The holder is made of robust laser cut blue acrylic, and has provisioned room for USB cable to connect to a PC. The USB cable can be connected from behind the holder or any of the two lateral large holes on each side. It&rsquo;s even applicable for bulky USB cable with ferrite beads. A pre-holed support at the bottom allows optionally securing the stand onto a bench for permanent position, convenient for faires, professional desks, etc. For more info and to get started with your RF Explorer, visit the start page. If you'd like to buy or change the RF Explorer Battery, please click here. © 2008-2019 Seeed Technology Co.,Ltd. All rights reserved.